Farmhouse ot renovate on 1ha of land. Beautiful traditional « Néo-Béarnaise », elevated position on mature grounds of 2000m2. The Pyrenees-Atlantiques is France's most south westerly department. It offers spectacular views, great beaches and a host of activities. The southern Atlantic coast offers some of the best surfing in Europe while the Pyrenees is excellent for hiking and climbing. 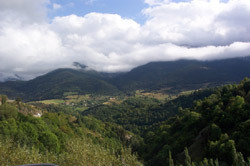 The department also boasts what is considered the prettiest village in France, Ainhoa. The departmental capital of the Pyrenees-Atlantiques is the welcoming and relaxed city of Pau, home to 90,000 people. This city has a distinctive Anglo heritage. In the 19th Century, it was a popular spot for rich English people and Americans. They left their mark on the town in the form of Victorian architecture. The majority of the centre, however, has retained its medieval look. Since the 1960s, the town has once again been rising in popularity. It has become a centre of both tourism and industry. In the west of the department you will discover Bayonne. It has a population of 42,000 and dates back to Roman times. The town serves as the capital of the Basque province of Labourd. Looking around you will find plenty of evidence of Basque culture and language. The town is famous for chocolate making and salt-cured ham. The latter is made from pigs fed on a strict cereal diet. The salt that is used on the ham comes from the attractive spa town of Salles-de-Bearn. Situated on the Bay of Biscay, the lively town of Biarritz used to be visited only by the very rich and famous. Nowadays, it welcomes everyone. 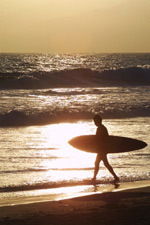 The locals seem to be experts on surfing and on balneology - the therapeutic use of mineral baths. St-Jean-de-Luz is located on the very South Western tip of France. Louis XIV chose this destination for his wedding. Seeing it as the first line of defence against the Spanish, he authorised the citizens to plunder any foreign boats they saw. This rule is said to be still be in effect today, although it is not carried out! In the past, Aquitaine has not been a very accessible place, although this has now changed. There are now direct flights from the UK to either end of the department, to Biarritz and Pau. Biarritz is also a stop for the fast and comfortable TGV train service. Outside of the Dordogne, Aquitaine as a whole has not been a very popular location for English buyers. The west of the department has very steeply priced properties and is high in demand. There are, however, a number of affordable renovation properties to be found inland. Do you know Pyrénées-Atlantiques better than we do? Do you have photos of Pyrénées-Atlantiques? Pyrenees-Atlantiques is located in the far south of the Aquitaine region of France. It shares its southern border with Spain.